Frank Duarte became a boxing fan at the age of twelve, but it wasn’t til 1970, when he was 15 years old, that he actually started boxing. Frank met his soon to be trainer, Louie Jaurequi, at the Teamsters Boys club, and Louie saw something special in Frankie. “Frankie had an incredible amount of natural ability, and he learned every thing I taught him as if he had been doing it for years”. 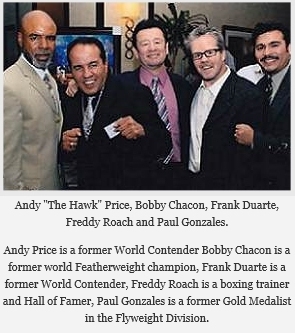 With Louie as his trainer, Frank went on to an impressive career as a boxer, and after winning the Golden Gloves twice and the Diamond Belt amateur boxing tournaments, Frank turned pro. During his career that spanned over sixteen years, Frank won the California Bantamweight and Featherweight championships. A Short time after that, he became number two bantamweight in the world, but was unable to get a shot at the world title, so Frank decided to retire at the age of twenty six. Close to five years later, at the age of thirty, Frank decided to make a comeback. “Everybody discouraged me, they all said that I’ve been inactive for too long,” but Frank proved them wrong by making it back to the number two Bantamweight in the world, and by winning the North American Bantamweight championship. 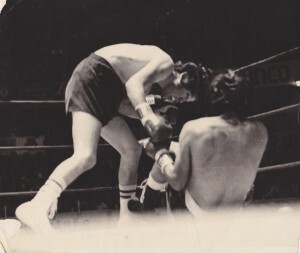 Frank finally got a shot at the world title, and in a hard fought fifteen round fight against a South American named Bernardo Pinango. Frank lost a close decision to the champ, but most of the fans, including ringside commentator Chick Hearns thought Frank deserved to win. By the way, the three judges scoring the fight where from South America. Frank retired in 1989 with a record of forty seven wins eight losses and one draw. It wasn’t long after Frank quit boxing that he began feeling a lonesomeness for something that he had loved for so long, so one day he visited the Wild Card Boxing gym to explore his options. After a few times visiting the gym, Frank noticed this one kid that always seemed to be there working out by himself, so, Frank offered to train him. In no time at all, Frank ended up with sixteen boxing students a day. Frank has been teaching boxing for a living for the past twelve years, and says he will never do anything but that.